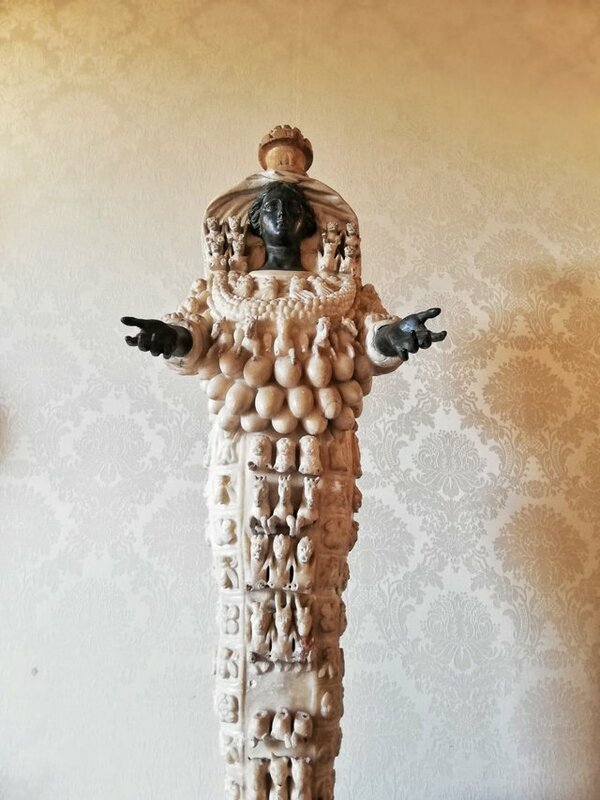 The traditional interpretation of the oval objects covering the upper part of the Ephesian Artemis is that they represent multiple breasts, symbolizing her fertility. This interpretation began in late antiquity and resulted in designations of the Ephesian goddess as Diana Efesia Multimammia and other related descriptions. Traditionally interpretation that the statue depicts a many-breasted goddess. Evidence suggests that the oval objects were not intended to depict part of the goddess' anatomy at all. In some versions of the statue, the goddess' skin has been painted black, while her clothes and regalia, including the so-called "breasts", were left unpainted or cast in different colors. R. Fleischer suggested that instead of breasts, the oval objects were decorations that would have been hung ceremonially on the original wood statue, possibly eggs or the scrotal sacs of sacrificed bulls, and which were incorporated as carved features on later copies.